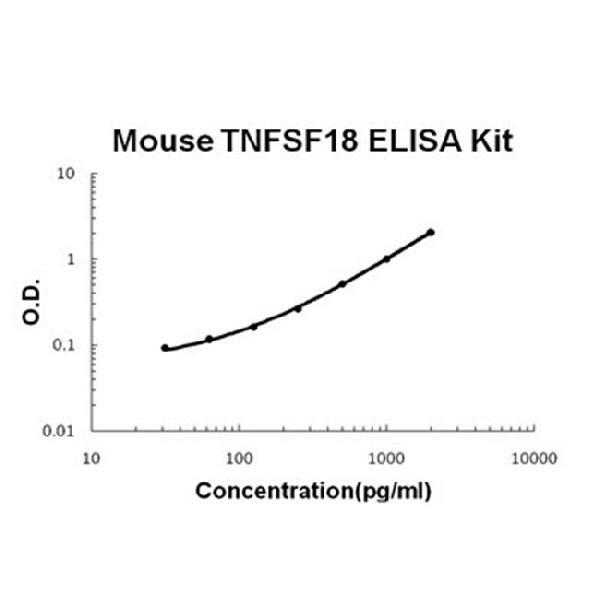 Sandwich High Sensitivity ELISA kit for Quantitative Detection of Mouse TNFSF18/GITRL. 96wells/kit, with removable strips. Detected in immature and mature dendritic cells and in macrophages (at protein level). Detected in spleen, lung, heart, thymus, monocytes, macrophages, B-cells and dendritic cells. .
Cytokine that binds to TNFRSF18/AITR/GITR (PubMed:14521928, PubMed:14647196). Regulates T-cell responses (PubMed:14647196). Can function as costimulator and lower the threshold for T-cell activation and T-cell proliferation (PubMed:14608036, PubMed:15128759). Important for interactions between activated T-lymphocytes and endothelial cells. Mediates activation of NF-kappa-B (PubMed:14521928, PubMed:14647196, PubMed:18178614). Triggers increased phosphorylation of STAT1 and up-regulates expression of VCAM1 and ICAM1 (By similarity). Promotes leukocyte adhesion to endothelial cells (PubMed:23892569). Regulates migration of monocytes from the splenic reservoir to sites of inflammation (PubMed:24107315). .
Tumor necrosis factor ligand superfamily member 18, also known as AITRL or GITRL, is a protein that in humans is encoded by the TNFSF18 gene. The protein encoded by this gene is a cytokine that belongs to the tumor necrosis factor(TNF) ligand family. It is mapped to 1q25.1. TNFSF18 is a ligand for receptor TNFRSF18/AITR/GITR. It has been shown to modulate T lymphocyte survival in peripheral tissues. This cytokine is also found to be expressed in endothelial cells, and is thought to be important for interaction between T lymphocytes and endothelial cells. TNFSF18-dependent modulation of tryptophan catabolism may represent an important mechanism of action of glucocorticoids, both physiologically and therapeutically.